Sorry Y’All. I do not seem to have much time anymore to visit the internet. I am still into my health kick, so exercise, cooking, and meditation cut into any free time I use to spend on the internet. I do not have any Lupus symptoms, so all this work has been worth the price in one way. I do miss seeing everyone’s blog updates. I took a class offered by our local Adult school on making Pysanky, otherwise known as Ukrainian egg dying. I have made Pysanky before. The last time was in 2007. I thought it would be an easy way to practice and not get caught up in it again. I really enjoy writing in wax on eggs. There is something almost spiritual in the process. So now I am caught up in it again. I went on Craigslist and found home grown eggs, duck and chicken. They dye more evenly than machined washed store eggs. 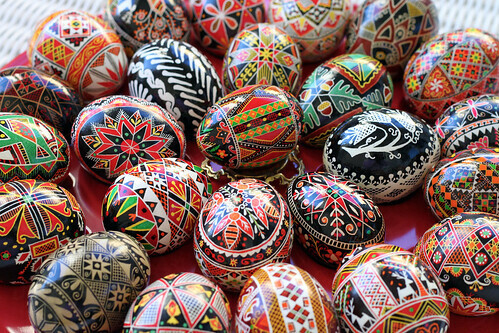 I have never decorated Pysanky with the drop-pull method. I practiced a bit on paper, but drop-pulling wax on an eggshell feels totally different. I am getting better but have a long way to go before I understand the technique. It is a technique where a pin or nail head is dipped in melted wax and pulled down the egg to make a tear drop shape in various patterns. It is hard for me to get all the drops looking the same. Here is a photo of my scratch eggs. I do want to master this someday. Just wanted to let everyone know that exercise does not get more enjoyable with practice. It does get a bit more routine, so it has become easier to make myself do it like any other chore. It does make life more comfortable once finished, like most other chores. This entry was posted on Monday, February 28th, 2011 at 3:38 pm and is filed under Craft, Life and Pysanky. Tagged: Craft, Life, Pysanky. You can feed this entry. You can leave a response, or trackback from your own site. Wow! These are stunning! From what I can see, you have definitely mastered this art form. Gorgeous! Each egg is a gem – just exquisite! Your ability & patience level are off the scale. Just beautiful and so happy to hear all continues well for you. Great to see your new post. OMGosh! 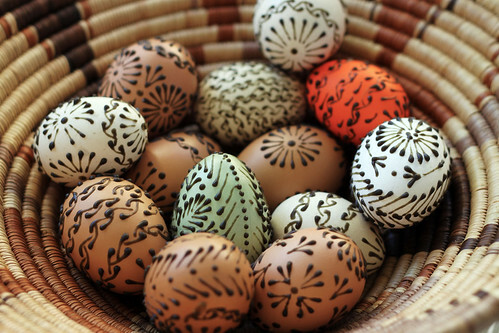 Those Eggs are absolutely GORGEOUS! I just got this fabulous Wire Egg Rack from Plow and Hearth! I’ll bet a dozen of those eggs would look lovely in that egg rack! They look spectacular in that bowl, though! WOW! Hey…I am making you a banner for your Facebook page so go visit it in the next couple of hours! LOL!